Tom lies on the ground after being hit by Joey and he gets a vision of himself, holding his infant son with Rachel saying that they were so close. Bellamy and Fred stand over Tom and Bellamy explains that the group killed him. Maggie calls Bellamy to tell him that Ray is cured and that they are going to be okay. At the Langstons the mood is sour. Fred goes to deliver the news to Janine that Tom is dead. Janine enters the house and gets a glass of water from the cupboard and breaks up a pill in the water, before carrying it in to Rachel, who is sleeping. It seems Rachel does not remember going to bed and Janine says that they had some tea together, where she explained that there is nothing more important than Rachel and the baby. Janine soothes Rachel and leaves the water at her bedside table, without telling her the news about Tom. Before leaving, Janine makes sure to grab Rachel's phone. Tom better come back, otherwise, poor Rachel is going to be left to Janine's mercies. At the Langstons, Fred explains to Margaret and Lucille how Tom died. Lucille points out that Tom was Jacob's oldest friend and the first to accept him when he came back. Margaret asks about the True Living group and Lucille calls them cowards, adding that someone needs to round them up. Margaret questions what Jacob is to be told because Tom was his friend. Lucille says that they will tell Jacob that there was an accident and that Tom died. Upstairs, Jacob plays with toys and listens in to the adults talking. Downstairs, Margaret says that Jacob should be told for his own protection but Lucille is adamant that Jacob is their child and that they will raise him how they see fit. Margaret excuses herself and Henry tries to tell Lucille about the factory reopening and the deal he had to make with the bank but she cuts him off to ask if he is sure and if this is what he really wants. Henry says that he is doing this for them. Lucille congratulates Henry, acknowledging that this means a lot to them. As Henry walks away, Lucille adds that she doesn't care what Margaret says, an eight year old boy doesn't need to know that there are people out there who want to hurt him. Of course, what Lucille does not know, is that both Jacob and Margaret heard her. Later, Lucille tells Jacob about Tom's death and his only response is to turn his teddy bear to face the wall. Lucille brings up how close Jacob and Tom used to be. Jacob denies being sad and says that he didn't really know Tom because Tom was different when he came back. Lucille starts to cry and Jacob apologises for making his mother feel bad. Maggie and Bellamy look through the observation window at Ray, who is doing well. Maggie explains that the fetal cells from Rachel's amniotic fluid only provided enough for one dose. Maggie does however add that if she can get more, Bellamy can send it to his government contacts and get them to mass produce it. Bellamy grabs his head and quips that his contact has not called him back. Maggie checks Bellamy's pulse and notices that it is weak and thready. Bellamy admits that he took his last dose last night and adds that he cannot afford to be admitted because he needs to find Rachel right away. Maggie suggests leaving it to Fred but Bellamy says that without Rachel, there is no hope for him, or anyone else. Henry is in the basement looking through the old line of furniture. Margaret says that it will take longer than they planned but they will get the factory up and running. Henry then reveals that he met with Brian and convinced him to go through with it. Margaret questions Henry's decision, pointing out that Brian is an unreliable partner. Henry questions why Margaret is second guessing his good fortune and brings up William Kirk, who used to work in the factory. Henry tells Margaret that they should be proud of all of the great things the family has done over the years, adding that the Langstons will be right back where they belong soon. Rachel wakes up suddenly and gets out of bed without drinking the water. Rachel asks Janine if she has heard from Tom and Janine asks Rachel to sit before telling her that Tom is dead. Rachel denies that Tom is dead and Janine goes on to say that Tom was hit by car while protecting the Returned. Rachel starts to cry and says that she needs to see him but Janine is adamant that this is not a good idea. Rachel bolts for the door, only to find it locked. Rachel demands to be let out but Janine again tells Rachel this is not a good idea and that she needs to think of the baby. Rachel tries another door and finds that it is also locked. Janine tells Rachel to calm herself, placing her hands on Rachel's stomach, saying a bible passage. Yes, Janine is getting well and truly creepy. At the station, Fred announces that they have an eye witness who got a partial plate. Fred sends Carl to the church to look for witnesses. Fred then notices Margaret waiting for him. Margaret storms into Fred's office and explains that Henry has been in contact with Brian Addison about an investment in the factory. Margaret adds that Brian, and his grandfather William Kirk, are trying to swindle them and declares it a crime, which Fred needs to stop. Fred tells Margaret that she knows how this works and that she led Henry to this. Fred adds that if Margaret and Henry share a delusion that they can get the factory up and running again that they deserve everything that's coming to them. Margaret says that when she returned, she had hoped that Fred had become a man in her absence and now she knows it will never happen. Fred simply opens his office door and Margaret marches out. Janine makes some tea and sits at the table with Rachel. Janine tells Rachel that she has been so strong and Rachel says that she has been selfish after what happened with Tom, adding that she is afraid to even go outside. Rachel makes a point of saying that Janine has done nothing but take care of her. Janine says that they are all they have now and Rachel agrees. Rachel asks for sugar for the tea and when Janine goes to get it, the the jar is filled with ants. Rachel uses the kettle knock Janine's head in and then steals the keys, as Janine lies unconscious on the floor. Jacob is looking through the album at old photos and he finds one of him and Tom together. Jacob then takes that photo to Lucille, saying that he thought it might make her feel better. Jacob leaves the room and Lucille cries holding the photo. Maggie and Bellamy leave the hospital and Maggie explains that Fred sent deputies to Janine's sister's house and no one answered the door and her car was gone. It seems that Fred has put an APB out on Janine's car and promised to call if she heard anything. Maggie says that Rachel could be anywhere and adds that Bellamy should head back into the hospital. Bellamy says that there might be another way to get the amniotic fluid. Henry calls Brian and leaves a message about going over some points on the deal. Henry then answers the door to find Fred. Fred returns the money Henry gave to Brian, who he claims admitted that his intent was to take Henry's money and skip town. Henry questions why Brian would do this and Fred brings up the fire in 1935, saying that the Langstons used their influence to cover up the fact that 12 people died in the fire. Henry calls it all a lie and Fred reveals that it took Bellamy twenty minutes to dig up the information. Henry then adds that Margaret knew all of this and this is how he found out about the fraud. Henry calls it a mistake and demands to know why Margaret would have kept that from him. Fred tells him to ask Margaret and adds that Margaret is a liar. Fred adds that if Henry does not believe him, he should ask Margaret what happened to Barbara before leaving. Bellamy drives towards the decommisioned military facility and says that if this doesn't work, they cannot let the virus out of Arcadia. Maggie says that she doesn't want Bellmay to give up but Bellamy says that he wants her to be prepared in case he disappears. Maggie refuses to accept that this is where it ends for them. Jacob heads downstairs holding the picture of him and Tom and tells Margaret that Lucille is sad. Jacob asks if Tom will come back and Margaret says that she doesn't know and that she has never heard of anyone who has died recently and come back. Jacob asks if there are people who would hurt them and Margaret says that the Returned remind people of things that they would rather forget. Margaret adds that Tom died protecting the Returned who needed them. Jacob is concerned that his parents could be hurt because of them and Margaret replies that she hopes not but adds that there are always people who want to hurt people who are different. Bellamy and Maggie have arrived at the military facility and announce that they want to see Angela. Later, in Angela's office, Maggie and Bellamy tell Angela what happened with Rachel and Ray. Maggie points out that stem cells stay active in the body for up to three weeks and since they have Rachel's old body, they can use the cells to make a vaccine. Angela says that she has to talk to her superiors and see what they have to say. Fred is back at the station and is handed a list from the DMV of the possible suspect cars. Fred asks about Carl and learns that he has not returned. An officer hands Fred a bottle of tear gas that a cleaning crew found wedged under a bookcase. Fred enters the storage room and looks at the police supply of tear gas and sure enough, there are bottle missing. Henry is back in the basement looking at the blueprints for the factory. Later, Henry is upstairs when Rachel returns looking for Jacob. Henry tells Margaret that Fred was there and accuses Margaret of knowing about the fire where the men died. Margaret questions what difference it makes that she didn't tell Henry and Henry says that the truth about their legacy makes a difference. Henry rails against the fact that he was told all his life that the family was something special and that they kept the town from ruin. Margaret says that it was a long time ago but Henry is enraged that the family covered up the murder, adding that he gave everything to the factory and when Jacob was found dead, he didn't know about it for three hours because of the factory. Margaret tells Henry not to blame her for his short comings and weaknesses. Margaret adds that if she knew Henry was going to fold under just a little bit of pressure, she never would have let him run the place. Henry asks Margaret if she has any idea how much they sacrificed for the factory, using the same words Margaret did the first time he took her to the factory. Margaret says that her husband didn't know because they protected him. Henry then demands to know what Margaret did to Barbara and Margaret says that Barbara needed to go for what Barbara did to Jacob. Henry tells Margaret that it is time for her to leave and when Margaret says that this is her house, Henry tells her that she has been dead for decades, before heading upstairs. At the military installation, Angela looks at Rachel's old body saying that they will be able to wipe the disease from the earth. Angela points out that the virus has jumped to the living and that Bellamy is infected. Angela is told that they are no longer authorized to provide treatment or resources for those who are already dead. Angela realises that the plan is to let the Returned disappear and is told that it is best to let nature take its course. Angela returns to her office and tells Maggie and Bellamy that they cannot help them because it is not in the government's best interest to intervene at this time. Bellamy asks for more medicine and is told that there isn't anymore. Maggie is stunned that nothing is going to be done. Bellamy asks about Jenny and is told that she has shown no signs of the virus but that he will not be allowed to see her given his symptoms. Maggie storms out of the office and Bellamy follows. At home, Carl is busy packing a bag, when Fred walks in. Fred tells Carl that they found the tear gas he threw into the church and matched it to the supply in the station. Carl is quick to say that anyone could have taken that but Fred is adamant that Carl did. Carl says that whoever hit Tom was an accident and questions why anyone would want to kill Tom. Fred informs Carl that he is going to jail and Carl asks what the point of all of this is because Tom could come back and death doesn't matter there anymore. Fred pull his gun on Carl and asks him if death matters to him now. Carl gasps and is then ordered to put his hands behind his back. Carl tells Fred that he is making a mistake because the Returned will be the death of them. Fred concedes that this could be the case but adds that he is a man of the law and killing is still killing. Jacob shows up at a vigil the people have set up from Tom and leaves behind a G.I Joe, as his parents watch. In the car, Maggie assures Bellamy that they can still find Rachel. Bellamy asks Maggie to promise that she will take care of Jenny. They are interrupted by a call and when Maggie reaches into her bag, she finds several doses of the medicine and says that Angela is not as cold as she looks. Rachel is driving Janine's car and is stopped at a train crossing. When the way is clear to go, Rachel simply sits in the car. Margaret is sitting on a bench alone, looking at a picture of Jacob. People continue to gather outside of the church for the vigil for Tom, when Joey and a bunch of men show up in pick up trucks. Fred tells Joey and the men to leave and Joey says that they are for a silent protest because Tom was a sympathizer. Tom brings up what happened the last time things got tense when the army showed up. Henry walks up and screams at Joey for putting crosses on their door. Joey brings up the work his family did at the factory and how Henry abandoned it when things got hard. Joey screams that just because Jacob, died didn't mean that the rest of them should have to suffer for it. Henry grabs Joey's clothing and Joey throws Henry to the ground. Lucille rushes over to Henry and Fred desperately tries to get control of the situation. Jacob watches from a distance. Margaret comes out of the shadows and puts her hand on Jacob's shoulder. Jacob says that this is because of them and adds that Margaret said one day they would have to go away. Jacob says that he wants to go now because he doesn't want his parents to get hurt anymore. Margaret and Jacob leave together. Lucille realises that Jacob is gone and she begins to look for him frantically. Okay, there were a lot of issues going on this episode. Let's start with class. There is no doubt that the Langston factory was the major employer of Arcadia and when Henry closed it after Jacob's death, it threw a lot of people out of work, many who had had generations of family employed by the Langston family. This is a point worth making. Though Henry was obviously grieving the loss of his son, he only thought of the factory as a sort of family legacy whereas to the people of the town, it was a necessary form of employment. In this we can see the class difference between the Langstons and the workers. Yes, Henry had the right to grieve but he also had the privilege not to think about the cost of simply dropping out of the community in a way that others did not. Once again, I have to bring up the issue of race and Resurrection. Bellamy is the only character of colour and his race is not really acknowledged. It continues to be the elephant in the room with the real issue being the oppression that the Returned face. It's as though they are a stand in for all of the isms that Resurrection is too cowardly to delve into. Once again, motherhood was a theme of Resurrection. On one hand we have Margaret the villainous mother who manipulates and lies to her children and family at will. On the other, we have Janine, who is desperate to be a mother juxtaposed to Rachel who herself is pregnant. What a hot mess. First off, why does Margaret even care about the legacy of a family that she married into. Her marriage was one of convenience and furthermore, it saddled her with a drunk. It would make more sense to me if Resurrection would make it be about Margaret's work keeping the factory running and not about the Langston legacy. I don't understand why Margaret felt compelled to lie about a fire that happened when she was a child. She didn't have the power at the time to deal with the fall out of it and so it makes no sense that she continued to lie to her own children. Janine is just plain and simple creepy. I am tired of the whole hand that rocks the cradle nonsense that Resurrection is engaging in. Why is Rachel's baby in particular so important to Janine? She and Tom could have adopted years ago and yet she is fixated on Rachel's baby. Is it the fact that Tom's sperm was involved? What? What is it? There is no way that two White, straight Xtians, one of them being a minister was denied the opportunity to adopt and therefore, none of Janine's actions make any sense. Then we have Rachel, who thus far has been a passive character. She has been kidnapped and totally dependent upon Tom and Janine. Slowly over the last few episodes, she has begun to show some active agency but still yet, much of her character has been reduced to the magical womb. I want to see her become more than that, particularly with the problematic portrayals of gender and motherhood on Resurrection. 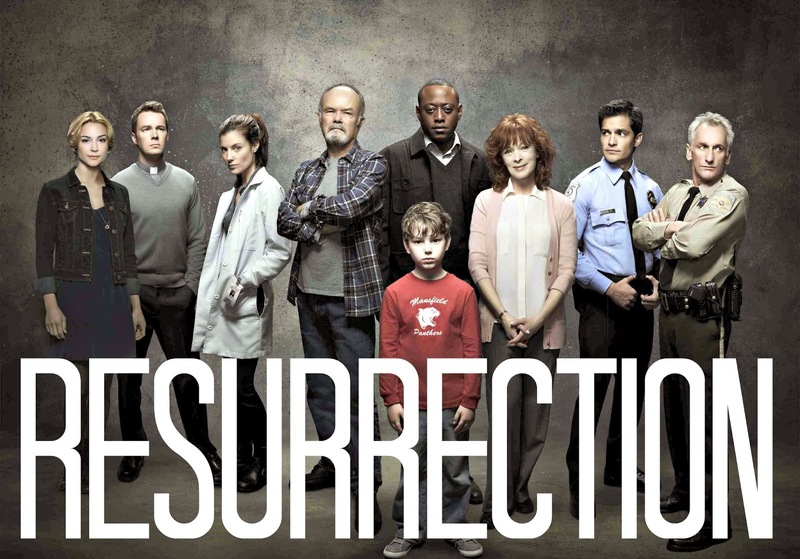 I think this is the mid season finale for Resurrection so I would be remiss if I didn't bring up the fact that it seems to have lost its thread this season. Yes the relationships are important but they have totally taken over the meta of the story. For instance, we are no closer to learning why some people return and others do not. We also don't know why people Return or if there is something behind it all. Instead of delving into this mystery, week after week, it's all been one big family drama with a little government conspiracy thrown in for spice. Resurrection needs to be more if it's going to hold onto its audience.